They were so intent on showboating their alleged concerns of illegal immigrants, they and other Democrats brought “dreamers” as their guests to the big event. It’s no surprise the media gave them a complete pass, failing to mention the fact these very same Democrats refused the president’s border wall funding proposal just weeks ago that included an extension of “dreamer” protections for another three years. So instead of deportation protections, DeGette and Neguse gave their constituents the consolation prize of a free ticket to a free event in the Capitol. Instead of DACA protections, Democrats insisted the government be reopened for just a few weeks in order to hold talks on border funding. Make that talk, singular. The appointed committee hasn’t actually met since they first organized when the government reopened. And, no offers have been made to fund the wall. 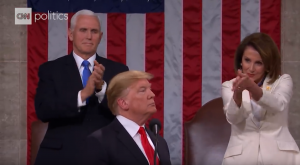 Trump’s speech opened with a strong, bipartisan marker, noting that his was not a Republican agenda or Democrat agenda, but the agenda of the American people. U.S. Sen. Cory Gardner also called for unity in his comments after the speech, applauding the president’s call for cooperation to fix our broken immigration system and fund border security. When the government shuts down again because radical Democrats refused to keep their word for a border security compromise, and swatted DACA protections in the process, Democrats would do well to remember that.